It does for a minute or two and I close my eyes, praying for just a little more time in bed. To no avail —I can’t pet her endlessly and fall back to sleep at the same time. That would absolutely be the bomb if I could—really. Next thing I know, I am pulling on sweats and slipping my feet into shoes (just in case I am forced to go on a walk) to quietly sneak downstairs with the dog so the rest of the family upstairs can remain blissfully asleep. Lucky dogs. I am by nature a morning person…yes even a five a.m. morning person…but it would really be sweet if I could just lie there in bed like other normal people and awake slowly to my day. But that is just not how this cookie crumbles I’m afraid. I flop onto our couch, turn on those damn perky morning talk show hosts and sit there a little frustrated that I am up. Of course, by this point, I am scratching Sadie’s ears, back, belly and anything else she aims my way. 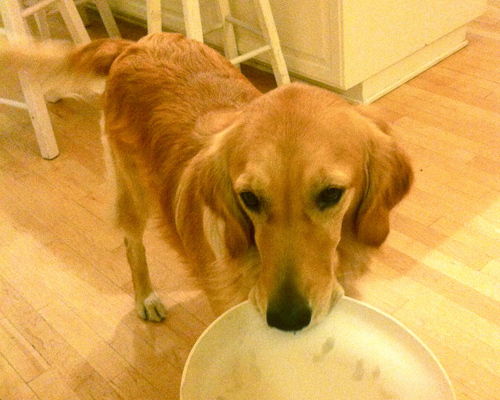 But soon that is not enough, and Sadie goes and gets a paper plate off the floor from her dinner the night before and brings it over to me. Apparently, that means she is ready to be fed. “Do you know it’s only 5:30am SADIE? !” So, like an idiot, I feed her because nothing says, “Let’s break this bad habit,” better than petting and feeding her. See that cute pic of her taken with my iPhone? How can you be mad at that? So thirty seconds later Sadie is done with her breakfast, and she’s ready for her walk or at least some ACTION. I do not oblige at first. I continue to watch the morning show, check my blog on my phone and say a little quiet prayer that Sadie will settle down when I throw her some of her quiet stuffed animals–a.k.a the non-squeaky toys. Soon that is not enough, and she digs through her toy bin (yes she has a toy bin of her very own) and finds the Golden God of toys—her squeaky toy and she begins squeaking as if she were going to win a giant box of biscuits for squeaking it 50 times in a minute. In case you were wondering, I have now officially lost the battle this morning with trying to avoid the walk. I text my dad, who is also a morning person, and ask…want coffee and a maniacal squeaking dog around? Sadie and I leave and head over to my parents’ house. Of course, Sadie is riding shot-gun in my minivan. Check out my previous post if you must see a picture of Crazy Sadie sitting human-style in the car. We arrive to find my mom in her kitchen making scones. She is my role model for jumping out of bed at the crack of dawn and baking! 🙂 At this point, I think, “JACKPOT!”. Finally, my morning was beginning to look a little brighter. Sadie, of course, got her walk as my dad and I meandered around their neighborhood being guided happily by Sadie. We returned to smell the most amazing aroma coming from their house. It was sweet and earthy and DIVINE! And if you think the smell was great, the scones were even better! They were not rock-hard like some scones are famous for, but they were fluffy with the most tender crumb. They had a nice lightly crisp outside, and they had little drops of exquisite jam baked inside. Oh My! This was heaven. If I had to be up and out so early, this was the way to do it. Sadie sat idly by, getting a biscuit or two thrown her way and finally ending up with the last crumb off my dad’s plate. LUCKY, LUCKY GIRL. I know, all you dog training types out there are screaming at the screen, jumping up and down telling me that I have this dog thing all wrong. I am supposed to be the leader of the pack, and I should be showing her who’s boss so that she can be a nice well-trained happy dog. Well, we have the happy down fine, and I am just not well trained enough myself to follow along with that kind of structure. It just ain’t happenin’. This post was supposed to be about my love of Afternoon Tea, and that is why you see the fixings for a wonderful cucumber sandwich to go along with my amazing left over scones I was sent home with. I have included the recipe for both and the pics because that’s all I have folks. 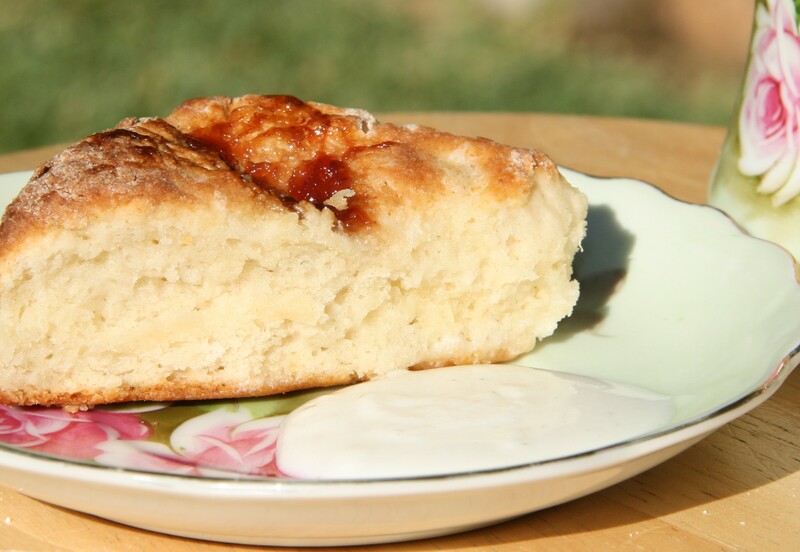 Enjoy your scones and cucumber sandwich on this hot summer day where ever you are, and if you have a crazy dog story you want to share with me, feel free to leave comments. I would love to hear them! Preheat your oven to 400 degrees. Combine first 5 ingredients in a bowl and whisk to equally disperse ingredients. 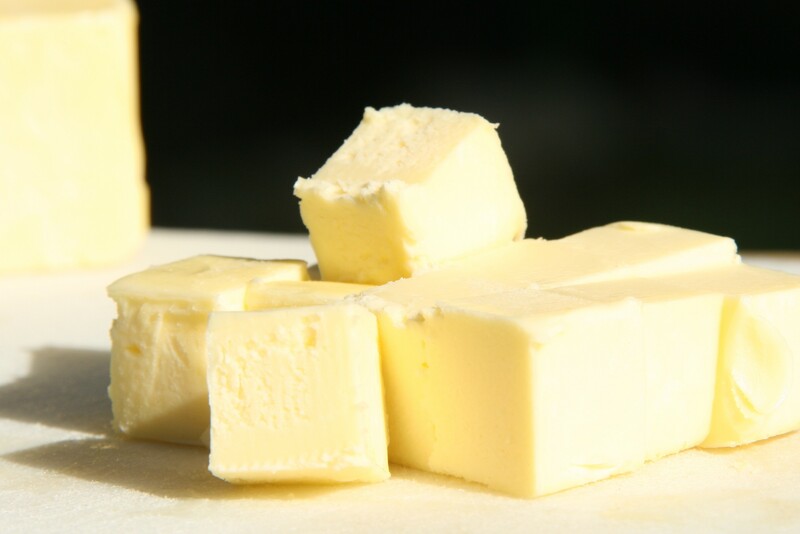 Cut in butter with a pastry blender or your hands until mixture resembles course meal. Add yogurt, and buttermilk just until dry ingredients are moistened (dough will be sticky). Add cranberries and barely mix until combined into the dough. Turn dough onto lightly floured surface; with floured hands, knead 4 to 5 times. Pat dough into an 8-inch circle on a baking sheet coated with cooking spray or lined with a Silpat mat. Cut dough into 12 wedges, cutting to but not through the dough; make a small slit in the center of each wedge. Place 1 teaspoon of strawberry spread in center of each wedge. Sprinkle with pecans. Bake at 400 degrees for 13 minutes or until golden. Serve warm. Yield 1 dozen. 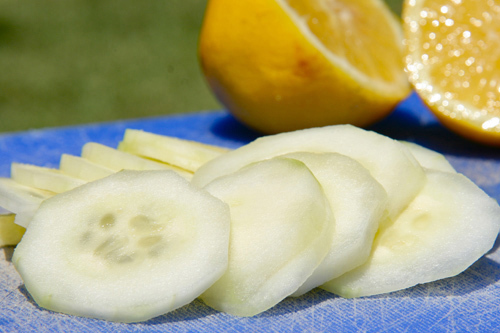 The cucumber must be sliced as thinly as possible. Very lightly salt the slices and leave them to drain in a colander, lightly weighted with a plate, for 2 hours or so. If I am just making one sandwich as I did today, I skip this part. It was delicious anyway! 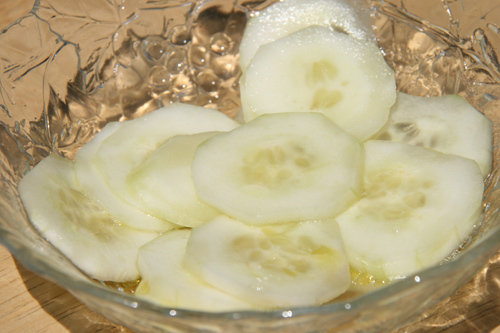 Combine the sliced and drained cucumbers with the oil and lemon juice. 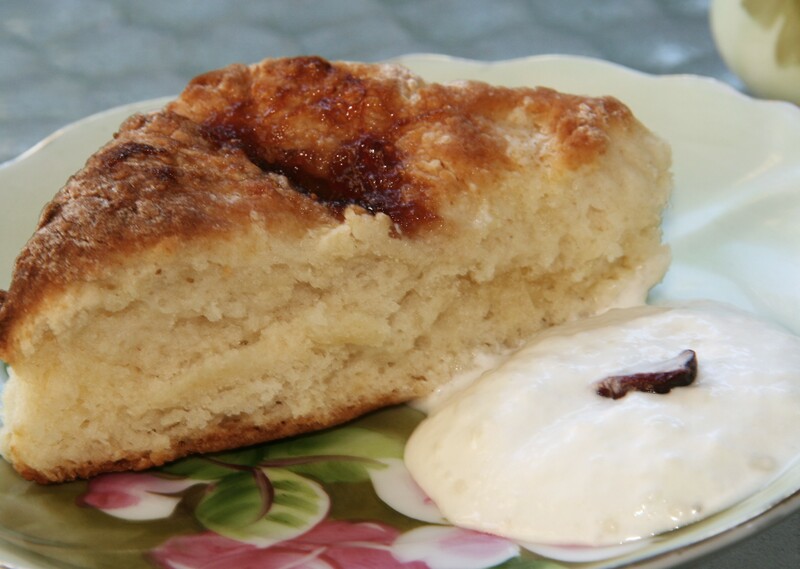 Cream together butter and cream cheese in a small bowl. Add lemon juice, dill and salt and pepper to taste. 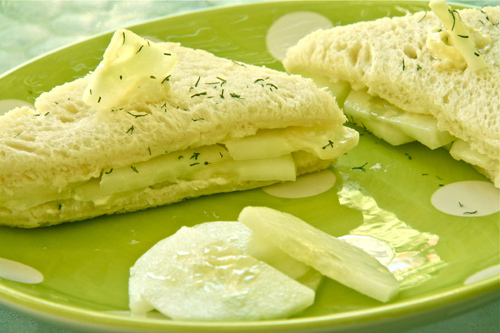 Spread generously on sliced white bread and layer cucumbers on top. Place slice of bread on top and cut off crusts and then in pretty triangles or squares. I garnish with triangles of the cucumber and dried dill. These look so yummy, as usual!! Sadie looks like such a happy dog! Scones and cucumber sandwiches – very English!